Well I have managed to make 2 so far. Please excuse the photography - didn't manage to get them finished in time to take them in the daylight. But I hope you can see the similarities. I don't have any kraft resist paper so I made my own with a piece of brown wrapping paper, music stamp and embossing. In the top left corner is a Poinsettia, but you can't see that now. 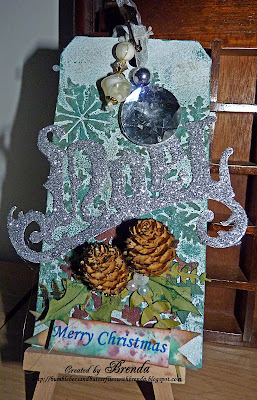 I also don't have the edge die and again improvised using a spellbinders border and using the cut away. I am quite pleased with the outcome though. I loved making the background for this one - great technique, but more improvisation as I don't have the coredinations. I also have to admit that the pinecones are off of an old decoration. Maybe I will be able to make some more soon, but I will certainly try when both school and Christmas preparations are finished. Have a wonderful week and thanks for stopping by to take a peek. You obviously do not need the co-ordinations or die etc as you have made two beautiful Tags, by being creative, and they are stunning. Love them both Brenda, they are awesome. Running out of words to describe your beautiful work Brenda because it is always amazing. I particularly like the reindeer he looks so ethereal. These are both just gorgeous Brenda and your improvising is fabulous. They both look amazing. I'm currently stuck on the third one as I haven't got any of Tim's stuff for this one and have gone back to the start twice as I'm not yet happy with it - groan. Way to go! Love this most beautiful Tag! It is easier when you don't work! Hugs! They both look fabulous, great improvising. Two gorgeous tags Brenda. I think it is good to improvise. You discover new things that set you off in an entirely new journey!! Stunning tags Brenda, love both of them. 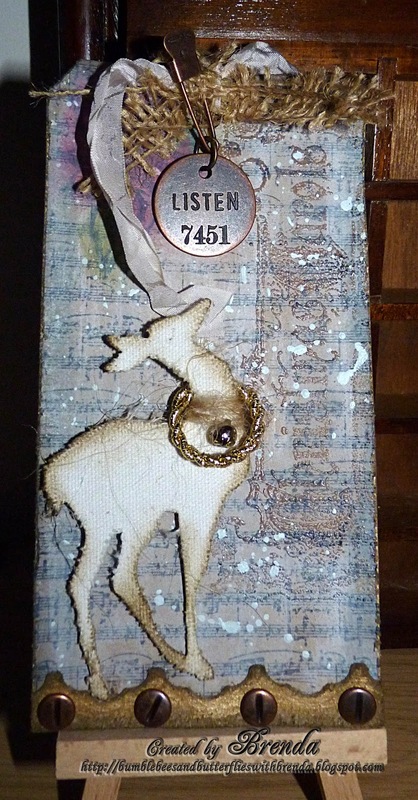 These are two gorgeous tags, love them, hugs trace x..mine are stil under construction! Am just catching up with my friends' Tim tags - these are fabulous! Love that deer... so cute. Brenda, both of these tags are fantastic, so wonderful details. Love the pine cones.